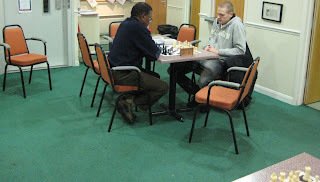 In this position, it is Streatham & Brixton Chess Club's first-teamer Adam Fysh-Foskett to play as white, against Ilford's Russell P White, from a recent London League clash. "White is currently attacking two (!) 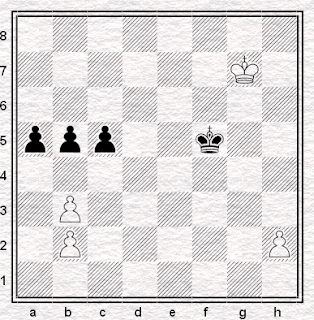 pieces and has an extra Marshall pawn," writes Adam, "but his king is under pressure and he is behind in development. How should he proceed? "The game went: 1. e4 e5 2. Nf3 Nc6 3. Bb5 a6 4. Ba4 Nf6 5. 0-0 b5 6. Bb3 Be7 7. Re1 0-0 8. h3 (possible, as 8. 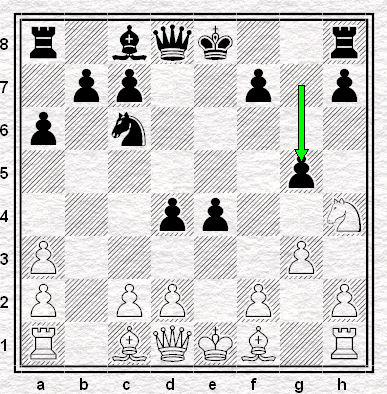 … Na5 leaves the e5 pawn hanging) 8. … d5?! (the disadvantage of playing a Marshall after 8. h3 is that White still has c3 free for his knight, 8. … d6 9. c3 transposes back to the main Spanish line) 9. exd5 Nxd5 10. Nxe5 Nxe5 11. Rxe5 Nf6 12. d3 Bd6 13. Re1 Ng4?! 14. 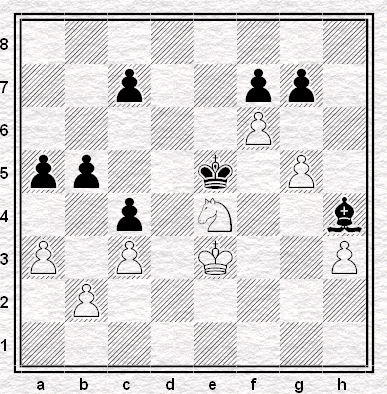 Qf3 Qh4 reaching the diagrammed position, after which White won." Thanks to Adam for sending this miniature & puzzle in to the blog, for our readers to test their chess with! ... with the same facial expression my one-year-old niece favours just after she's filled her nappy. This picture is part of a fantastic collection of photos taken at Wijk aan Zee recently, as published on the ChessBase website. FM Fontana v Horton, Copa Delegación final 2008, top board, Jaime Casas (Monzón) v Casino Jaque (Huesca). Position after 40.Rh3. and the game was drawn (although the match was narrowly won by Jaime Casas). But there is a big hole in this line. What is it? The answer should eventually turn up in the comments box so don't look before giving it a go! Jan Timman lost a FIDE world championship match to Anatoly Karpov in 1993, a match played in four different cities. But to whom did he lose a world championship match played in St Petersburg in 1980? If you're a Charlie Brooker fan (and if you're not you should be seriously asking yourself why) you will already have read Screen Burn in yesterday's Guardian. Of course if you're anything like me, i.e. too cheap to shell out for an actual paper, you'll have got it online for free. "the best TV show of the past decade"
"... the best TV show since the invention of radio." [long story short, they're feckers who take longer to send me the stuff I order than it would take me to walk to the subcontinent to talk to their 'help' desk in person rather than have them ignore my emails of complaint. ... I'd be tempted to start buying it on DVD. Of course I could just get it at play.com. Costs a few quid more than gitazon but at least the stuff I order from Play actually arrives. Can't have everything I suppose. Complete list of videos we've mentioned on the S&BCC blog available here. I've been on the radio! After Bobby Fischer died a local radio station asked me to come on to their morning show and talk about Bobby, being a chessplayer, that sort of thing. I was a bit disappointed that they didn't offer a fee - I don't think the woman at the other end of the phone really needed to laugh when I mentioned the word. She then said they'd pay a fee if I could get Fischer himself to appear and then laughed again, at her own joke. I nearly said that if that was her attitude they could invite Fischer on instead, but I thought better of it. I arrived at the radio station about half an hour before the time I'd been asked, forgetting that it wasn't television and they wouldn't need time to apply makeup. I went up to reception and said I was Geoff Scorebook, here for my interview. "Oh", said the youth at the desk, "are you the grandmaster?" "I am", I said, wondering if he would ask me for my autograph. "Thank God for that", he said. "The snake charmer hasn't turned up and we needed some kind of novelty act for the breakfast audience." I wasn't sure I'd heard right and by the time I had a retort ready I was already sitting down in a room next to the studio waiting to be called. A man came through the door from the studio and shook my hand. "Mr Notebook?" he asked. "You'll be on in just a few minutes." And he asked me a few questions about what I did, had I ever played Bobby Fischer, had I met anybody famous playing chess. "I don't mean chessplayers", he said. "I mean famous people." I couldn't really think of any - when you play chess you tend to know a lot of chessplayers - but I was trying to think if I'd met anybody famous at an opening ceremony or something when he looked at his watch and said "right, three minutes. Come in and meet Dave and we'll get going after the news." So in I went and shook hands with a man with a microphone, who introduced himself as Dave. "I used to play chess at school", he said. "But I could never remember how the prawns move. Besides, I liked girls and girls don't like boys who play chess, do they?" I thought he gave me a funny look but the news was on so I was concentrating more on waiting for the interview to begin than on Dave himself. But shortly it was time to start and Dave nodded at me, leaned towards the microphone and said, "welcome back to the morning show. Today, we have a very special guest in the studio: local chess grandmaster Geoff Notebook, and we're going to talk to him about Bobby Fischer, playing chess - if we can stand the excitement - and anything that you want to talk to him about. So, Geoff", he said, turning to me, "it must be really interesting being a grandmaster. What does that mean? Is it like Robbie Coltrane in the Harry Potter books?" "Ah, no", I said. "It's just a title really." "What", said Dave, "like Baron Notebook, something like that? Do you inherit the title, when your father dies?" I was going to say that the only thing I inherited from my father was his debts, but instead I said no, you have to play to a high standard for a certain number of games and then you get the title. "Ah," said Dave, "like they do in sumo wrestling, where you can become an ozeki or a yokozuna?" "Yes, a bit like that", I said hopefully, not knowing much about sumo wrestling. "So do you have to commit hari-kiri if you lose a big match?" asked Dave, to the sound of laughter from the producer. "Blimey, chess is more exciting than I thought." This wasn't going well so I said that no, you didn't have to kill yourself, but you did need to keep up a certain standard if you wanted to support your family, and he gave me a look that seemed to mean that I was just as boring as he had expected, a look that did not change for the better when I added that we, too, had a sense of honour and would often resign if we failed in our duties. I thought that was quite funny but clearly I wasn't supposed to be doing the jokes and we moved on to a discussion about Bobby Fischer, what he was like - I didn't know him, I said - and what impact had he had on my life. I said he'd inspired me to take up chess. "Inspired?" asked Dave, and the producer inexplicably started laughing again. So I explained how a whole generation of English juniors took up chess after seeing the Fischer-Spassky match in the paper and on television and how we had developed a lot of world-class players as a result. Dave perked up. "So are we really good at chess, now?" he asked. I said I was afraid not, most of the best players of that era had died or retired and nobody had replaced them. "So you're pretty much the best we can do now?" asked Dave. "I suppose so", I said, surprised by the flattery. "Well", said Dave, "Let's see what the public has to say about it - if anything. Have we anybody on the line?" "Yes, said the producer (I thought I heard Dave say "what a relief") and our first caller today is Frank." "Hi, Frank", said Dave, "so what do you want to ask Geoff this morning? Anything you want to - check with him?" Well, Frank turned out to be a club player and we had a nice talk about our favourite Fischer games. And I started to enjoy myself, telling people about the life of a chessplayer. Did I work hard? Well, sometimes I did and the travelling was hard, but it's pretty much all I know so I don't have much option. Had I played any big tournaments recently? Yes, I'd played at Hastings and finished just out of the prizes. Were there any good lady players? Well, Judit Polgar's a world-class player and there's many Indian and Chinese girls who look like they could reach the same level. Did I ever find chess boring? No, it might be slow sometimes but so was cricket. And so on, and despite themselves Dave and his producer seemed to get interested in what I did and what I had to say. I barely noticed that I time was almost up when Dave said "well, we've time for one more caller" and gave me a grin, which I returned. "Who's on the line?" asked Dave, and the producer said, "it's Janey". And what does Janey want to ask Geoff?" asked Dave. "She wants to know how much a grandmaster earns", said the producer. "Ok, Janey", said Dave - "you can ask Geoff yourself!" And Janey came on the line. Janey. My ex-wife Janey. How in God's name did she know about the show? She doesn't even live in the area. Somebody must have told her about it. I looked around for Dave like you might look for a banister before falling down the stairs. "So, Mr Scorebook", she said, "how much does a grandmaster get paid?" She didn't say that she knew me, so I pretended not to know her either. "Well, er, Janey", I said. "It's not always a very reliable income. It depends on lots of things." "Does it depend on how much of it they spend on drink?" she asked. "Or on women other than your wife?" "I haven't got a wife", I retorted. "No, you have an ex-wife", she said. "She used to be your wife. And she used to get maintenance, too." I didn't say anything. There was nothing I could say. "Anyway", she continued. "The next time you fancy trying to climb into the hotel room of some teenage trollop in Hastings, do try putting your maintenance cheque in the post beforehand. Or try to win some bloody money so it doesn't bounce." "Ah", I said. Or it might have been "uh". "Bloody chessplayers", she said. "Powerful queens and too close to their mothers. I should have listened to my mother." And the phone went click. "Well, thankyou, Janey!" said Dave: I write "said", but he was practically cheering. "Oh, and thankyou Geoff", he added. "We all hope you're able to pay your maintenance soon. And after some ads, it'll be the news." I got up, banged into the wall beside the door in my hurry to get out, and ran. I spent the rest of the day not answering the phone in case it was Janey. Or the newspapers. 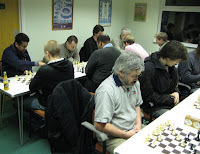 Our Mid-Season Rapidplay Tournament took place on Tuesdays 8th & 22nd earlier this month. The event was a great success with 22 players taking part - so many that some even had to play their games downstairs (see the final photograph in this report.) The event was won by the present writer who scored six out of six, whilst Martin Smith enjoyed lone second place on 4½/6, and Angus French, Jonathan 'B' Bryant & Mohsin Nasr shared third place half a point behind him. 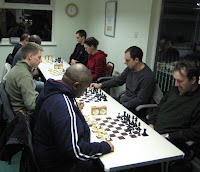 Thirteen players from the Streatham Library chess group took part in the event. Some acquitted themselves really well and all contributed to the general enjoyment of the event. In games where 'library' members met established club players the establishment almost always triumphed but the games were sometimes closer than might have been expected. Indeed, on a number of occasions the library member's defeat remained undecided until the last few ticks of clock. The library did have it's moments however. Alexey Shumey scored a pair of draws against stronger opponents while Danny Hewitt & Mohsin Nasr ('Naz') went one better in registering wins against main club players. In fact Naz produced a great result by finishing joint third overall, with four points. According to the ratings relied upon for the event, Naz was seeded 14th so his result significantly exceeded his ranking. Well played sir! I can add to that by saying Danny Hewitt caused me a lot of trouble in our round 1 game, which I was lucky to win in the end. From my games, I was most pleased with my win in round 4 against Martin. The game was described as looking like a "grind" by Jonathan B afterwards, although one man's grind is another man's grin. Grind or otherwise, the game was remarkable for one particular moment: the 'spiral staircase' maneuver Be2-d3-e4-d5-e6-d7 that took place between moves 18 & 22, which I am not sure I have ever seen before. Finally, special thanks should go to organizer & official Angus, as well as to Barry, who looked after the venue & performed a splendid job as barman. Or, the year before last in Marienbad. 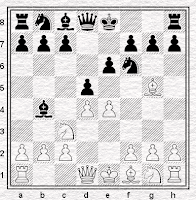 Babula (IM) v Horton, Marianske Lazne 2006, two years ago this week, position after White's 33rd move. Quite likely the closest I've ever come to beating an IM: Black has two choices and I chose the wrong one. I'm not even sure, in retrospect, that I spent any time considering the right one: I just took off the pawn on the assumption that I was winning the ending, and found that I was not. Now 40.h4 Kg4 41.Kg6!! and while 41.Kf6 c4! 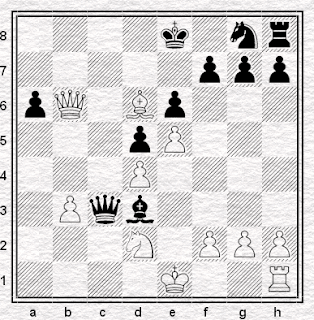 would have won for Black, now if 41...c4 42.h5 gives White winning chances. So Black is obliged to play 42...Kxh4 which allows White's King a space to squeeze though to get home: because if instead 42...c4 43.bxc4 bxc4 44.Ke4 and Black has to scramble to save the game. Doctor Tarrasch's face was covered with red blemishes. He asked for an official and demanded absolute silence in the playing hall. One careless moment, careless because everything seemed to be over, and everything changes. I don't often find myself sharing mental space with Siegbert Tarrasch, but, briefly, in the Czech Republic, two years ago this week, I think I did. "Nothing eases suffering like human touch," as reported by Sara Blask at the end of her long article here at The Smart Set. "Speaking of Dump Trucks, Aunt Peedy..."
Our blog is for many things - posting fun chess videos, reporting local chess news, letting people know about exciting upcoming events in or around London, setting the odd puzzle, taking a look at the occasional book, reporting on chess curiosa from the chess blogosphere or the world at large, keeping in touch with one another, outright trivia, letting potential members of our club know what we're like, charting the continuing adventures of Geoff Scorebook - you name it, the list goes on and on. But let's not forget self-indulgent bragging celebrating the achievements we're proud of. Some years ago, I rounded off a tournament on the Isle of Man with a last-round game that ended in a draw just after the time control. Reasonably pleased with myself at the time, I was mortified when Angus later informed me that I had agreed a draw in a position where I had a win, and further mortified when he informed me that my opponent was a journalist on the Sun. You mean, I said to myself, that I'd shaken hands with somebody directly responsible for degrading the politics and culture of my country at the behest of Rupert Murdoch? I found myself reflecting on this reaction just a few months ago when it was reported that FIDE were considering defaulting players who refused to shake hands before games. I had no real objection. After all, if it's really so important to me to avoid shaking hands with an opponent on the grounds of their moral turpitude, I am surely principled enough to accept a lost point as the price of doing so. On the other hand, I wonder whether there should really be a rule compelling players to shake hands with Nigel Short. Ivan Cheparinov presumably thinks not and it's hard to not to see his point of view, particularly when one remembers that the notorious "dunderheads" interview didn't just involve insulting people who arguably needed insulting, it also involved making serious claims about a number of people which did not appear to be supported by evidence. If you spend your time picking feuds with other people, eventually some of those people are going to balk at shaking your hand, however many friends you have at Chessbase. Besides, I'm not going to be po-faced about this sort of thing. It's all entertainment and I doubt it does anything to damage the game. I grew up on Korchnoi and Karpov refusing each other's handshakes and it never stopped me going down the chess club. There's a passage in Fever Pitch, involving a celebrated Arsenal v Norwich brawl that ended (if I recall correctly) in points deductions for both sides, where Nick Hornby points out that while we are actually supposed to deplore this sort of thing, we in fact enjoy it immensely. Chess is a clash of minds and personalities: rather an occasional hissy fit be thrown than boards and pieces hurled at one another. Rather an occasional refusal to shake hands than hold-me-back-lads and inviting one another outside. Probably. Actually, one can't really imagine professional footballers behaving like this before a game, which is probably why there's no rule obliging players to shake hands in the centre circle. Still, if FIDE think they can defeat the problem through legislation then good luck to them. Personally I think the ingenuity and childishness of chessplayers may prove too much for them. For what, after all, will constitute an acceptable handshake? Will it be all right to merely touch palms in mid-air? Will there be complaints that the opponent squeezed too hard? And what happens if you do it with your fingers crossed? I expect all these questions and many more to be answered in appeals yet to come. Would I shake hands with Nigel Short? Would he, indeed, shake hands with me? So far, probably because he is a very fine chessplayer and I am not, we have never yet met over the board and thus the question has not been tested. Indeed, I have never spoken to him and he has only spoken to me once. But, brief though it was, it was a courteous exchange. During the tournament I referred to in my opening paragraph, just after the first round began, I went to use the toilets - and as Nigel was just behind me entering the Gents, I held the door open for him. "Thankyou", he said. After that I never saw him again. Today's post was originally published, briefly, on Friday. These days, assuming ASBO wielding teenagers haven’t already slaughtered us in our beds, we are more than likely to be eaten by Rottweilers as soon as we step outside our front doors. In the unlikely event of an of us actually making it all the way to the club for the second leg of the quick play tournament next Tuesday we will no doubt find the boards swimming in Norovirus inspired vomit, and probably succumb to Bird Flu by the end of the night. That’s if George Bush, Al-Qaeda, the nuclear industry or some combination of the above don’t blow the entire planet to smithereens before Angus gets a chance to do the fourth round pairings of course. As if that wasn’t enough to deal with, earlier this week, Tom Hodgkinson and The Guardian uncovered a new catalyst for disaster. Yes my friends, Facebook is out to get you. The full details need not detain us here but it seems that the social networking site is turning us all into little consumer drones. We, naïve fools that we are, are happily taking a Facebook marketing probe up the Jemima every time we log on and all they give us in return is the opportunity to play Scrabulous twenty four hours a day (a fair exchange, I say, but we won’t even get that soon). Did he really say that do you think? I mean really, actually, said it? Well maybe he did. Maybe he also said, “Greed is good”, and, “Lunch is for wimps” while wearing a striped shirt with red braces and driving a Porsche 911, registration “PR1CK”, 200 miles an hour down the M4. I’d always assumed, though, that some phrases are just so inanely stereotypical that nobody can ever have actually said them in the real world. I digress. Let’s get back to the claim that Thiel is a chess player. My suspicions were aroused by the lack of capitalisation for “master”. Indeed, a brief perusal of the FIDE website confirmed Thiel is rated 2199 but has no title. Chessgames say that he can claim to be a “National Master”, presumably a party hat given out by the US Chess Federation or some such, but I think it safe to say that Thiel, while better than I’ll ever be, is nowhere near as good as a non-player would assume reading Hodgkinson’s article. Still, we should never let tiresome facts get I the way of a good conspiracy theory. Oh, one more thing … according to FIDE, Thiel has been inactive since 2003. All that capitalist plotting must be keeping him busy. The premature death of Bobby Fischer, like the premature death of his chess career, reminds us how difficult it is for chess to have a public image that is both visible and wholesome. Bobby was famous because he was a great player, but he was not famous just for that: his madness and his isolation are what made his death, in the eyes of the public, a real chess story. As individuals, members of the public may be fascinated by chess, even if they scarcely know the rules. As "the public", they rarely, in the UK at any rate, see anything of the game unless there is something more than the game to read about, unless there is something tasty to serve it with. Danny Gormally fighting over a girl, Nigel Short insulting the dead: these are chess stories. If it's just chess, people are either uninterested, or assumed to be. Of course it's true that any story will go further if it's souped up with scandal: but while some events are newsworthy in and of themselves, chess is not. Chess seems to need the accompaniment of irrationality and violence and stupidity: perhaps because these defuse chess, demystify it, make unfrightening what was previously incomprehensible. That is how we deal with what makes us nervous - we laugh at it. Art, culture, literature. All the intellectual structure of thought and its application which support these endeavours: these make us nervous and insecure. So we laugh at them. Look at the silly chessplayers! But that is only half of it, the half chessplayers want to look at. Because Fischer was mad. He was close to madness while he was playing and he descended into madness as soon as he stopped. And we must ask ourselves whether that madness had something to do with chess. Whether the story of the unbalanced mind, addicted to the chessboard, played out in Fischer's unhappy life, was something to do with chess itself, not just the mind of Bobby Fischer. Whether it was not, in fact, a pattern, a syndrome: because if its effects were most extreme in Bobby Fischer's life, we must accept that they have been played out in the lives of other champions too. Whether, in fact, chess is not some sort of trap for the brilliant but vulnerable, a gradual poison which wrecks the lives of those who are most fond of it, and best at it. Such would be the theme of more than one novel: The Luzhin Defence, The Luneberg Variation, The Royal Game. How closely are those novels related to life? Some years ago Bill Hartston wrote something to the effect that chess did not make people mad, but rather, kept mad people sane. It's a good line, and a better one for there being a great deal of truth to what it says. Perhaps Fischer only tipped over the edge when he stopped playing and as a result: he lost his goal, he lost what gave structure to his life, what made him get up in the morning, what made him work. His obsessiveness lost its grip on something he could understand, something he could grapple with, and instead turned its attention to something he couldn't understand at all: the world outside, the world of people. Or, perhaps, it was chess which did for Bobby Fischer: too much chess and not enough of anything else. It's not unusual for a professional sportsman to know little of the world outside his personal speciality. You concentrate on one small aspect of life from an early age, you excel at it, you neglect the rest, perhaps because you have to in order to succeed. So you get a warped experience of the world, lived through the prism of whether you have defeated other human beings or whether they have defeated you. A small if fascinating board game, in becoming your life, takes on enormous significance, and you have little enough knowledge or experience of anything else to help you put that game in its proper perspective. The game itself becomes a vehicle for promoting one's own ego and self-image - not just now and then, not as one of the mildly unhealthy vices that it is healthy for us to have, but as one's whole life and purpose. There are more than a few chess professionals who are trapped inside that particularly sterile cage. 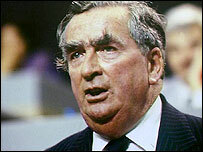 Denis Healey called it "hinterland". Living, as he did, in a world of full-time professional politics, he had many colleagues, and many adversaries, who knew only the world of politics, its ins and outs, its machinations, their own travails and careers within that world. It was destructive: you had to be able to step back from it, not just in order to look at it properly, but in order to remain a fully-rounded human being, rather than a machine playing a part in a machine. Hinterland: many professsional players seem to me to lack it, top players more than most. Bobby Fischer, who declared "life is chess", lacked it more than any of them. It means culture, the art and literature to which I attached chess earlier in the piece, but from which the game is too often detached. To me chess is a component of a wider cultural education, one part of the process in which we stimulate our intellect and our curiosity, our ability to appreciate, our ability to think. To take chess on its own is to lose the capacity to say why we do it, because we lose the capacity to say what it means. Why do we play chess? To crush the other guy's ego? What meaning is there in that, what values may we locate within it, what aesthetics does that process possess? There is nothing to be learned from treading on other people. One may play chess for that reason. One may play better as a result. One may even become world champion. But one cannot in that way enhance one's life and personality by means of chess. And the ego that we crush will eventually be our own. I can't help feeling that chess is at fault here, in some capacity, that Bobby Fischer killed himself using chess as his weapon. That chess doesn't just keep mad people sane, but like morphine to an addict, it creates its own addiction, its own obsession, and ultimately an overwhelming one. It is most addictive to the people least capable of dealing with it: and they are least capable of dealing with it because they are good at playing it. We can see Bobby Fischer as an extreme example: we can see him as an unrepresentative example. But can we really see him as no example at all? As irrelevant to explaining what can happen, when one gets too involved with playing chess? Just to inform people who may not already know, that Bobby Fischer died today. We will presumably write more shortly. Everybody will. Still, at least I was presented on the Saturday with the latest issue of Disinformator, my favourite club magazine, the intermittent house journal of the Oxford City club. There's a lot of good chess in it. But even more importantly, there's a lot of bad chess: a lot of very bad chess indeed. Good chess may, in theory, be instructive, but in practice we rarely seem to improve our chess by studying it: but bad chess is always entertaining and we inevitably improve our mood by playing through it. Disinformator doesn't disrespect the people whose games it carries: it merely enjoys the struggle all of us have, to hold on to our balance when confronting the impossiblity of chess. I have many favourites already in the magazine, but here's one example, from a game Hale-Wang, that I found particularly charming. Having got, at the very worst, perpetual or the exchange of queens a pawn up, White, thinking it better to deal with Black's counterplay, meets the threat of 1...Qc1 mate with 1.Kd1. Don't laugh. Everybody's done worse. The magazine is available from Sean Terry on sterry@brookes.ac.uk. A Claim to Shame? A Claim to Fame? 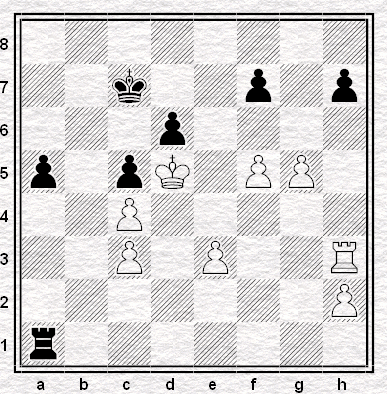 my move 10...g5 appeared in the fifth book of the Secrets of Opening Surprises (SOS) series. My excitement when I picked up the book and flicked to find Chan-Smerdon, Queenstown 2006 - the game in whose notes the move was published - was, however, short-lived, and quickly turned to shame. Neither my swashbuckling win with the move nor the analysis I'd emailed in featured. Instead, some other move was given returning the piece, after which my idea looked a little more than suspect, and I left the bookshop blushing. However, David from Barnet Elizabethans Chess Club has had rather more analytical success: his claim to fame being to correct an error in the mighty Endgame Tactics by Van Perlo. You can find the error he uncovered here. "Maybe one day the book will be considered an all time classic," he writes, "and I'll be able to tell the grandchildren about the time I helped to fix it up..."
Any other such claims to publishing fame or shame out there? We're nothing if not petty-minded on this blog, so we exhibited very few signs of distress when Angus drew it to our attention, yesterday, that Nigel had been beaten by a thirteen-year-old in twenty-three moves. Unfortunately these days Nosher has a sense of humour about this sort of thing, but so do we, so if you have not enjoyed the game already, it is provided here for your enjoyment. Aficionados will enjoy the presence of Nigel's favourite bad move, ...g5, which features in many of his worst disasters, in the position below. Should you find yourself wandering around central London tomorrow with a spare ten thousand pounds weighing down a pocket or two, why not pop into the "The Gentleman's Library Sale" at Auctioneers Bonhams and take a punt on The Cambridge University Chess Club Board? As the Lot Details makes clear, more than one famous name features on its surround. Although judging from the number of paragraphs dedicated to him in their Lot Details - nine - of most interest to the auctioneers is "the notorious Aleister Crowley, the noted Satanist, writer, philosopher and chess player." 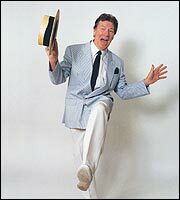 ... one year, a college and four boards away the extraordinary Sir (Philip) Stuart Milner-Barry. Thanks to Richard T for the tip-off on this one. Have you ever stuck that King ...? Tom and Justin are away for the weekend, although for Justin being away means he's here but that's another matter, and I've been left minding the shop. I told them that I'd be ready to do my first post of the year today but the truth is I haven't got around to thinking what I might like to write about ... so I'm going to take the easy route and poke some fun at Chess Now. If you thought Kutnetzov-Gajewski was surprising, it's nothing compared to Murey's 4...Nc6, a move so high on the made-my-eyes-pop-out scale that you're probably reading this with your eyeballs on the table. In all seriousness I'd wonder whether any move quite so surprising has ever been played quite so early in a serious grandmaster game. 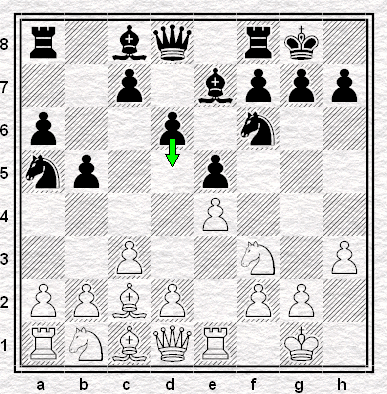 1.e4 e5 2.Nf3 Nf6 3.d4 Nxe4 4.Bd3 Nc6 - how did he ever think that one up? Murey lost the game, but won the Informator best novelty award. It's still played now and then. I love it. I was reading with interest a debate about the 20 Seconds Chess tournament on your website and in particular a concern from some of your posters over who the four special invited guests would be. We have invited two GM 's Keith Arkell and David Howell as our guest players. The two other places were allocated as wild cards for 2 players from the group stage. The idea was simply to give low ranking chess players the chance to pit their skills against a GM in a new competitive format. As this is our first event I am keen to get as many local players involved and realistically we will have around 100 competitors on the day and our main mission is to test the new format in a competitive environment and to see if it actually works! Also, with the numbers being relatively low there's also really good chance that someone from your club could win one of the cash prizes on the day (£2,000, £500, £250 & £250). I would be grateful if you could share this information to your community and if they wish to take advantage of the discount they simply need to write your URL on their entry form. Your chances just got better - and the entry fee just got lower. So, here's a link to the tournament homepage again. Alekhine liked to play this opening: five times in the mid-Thirties, against strong opposition, including a win in one of his world championship matches against Boguljubow. I read somewhere, possibly in Bill Hartston's old Benoni book, that he referred to his fondness for the position as one of his weaknesses, though I can't recall the exact term he used. I'm not sure what he saw in it: I'd have assumed the idea was to play ...Be7-g5 to swap off the bad bishop, but Alekhine doesn't seem to have played it that way. I have, once, in an email game about a year ago: I lost in about twenty moves to a much lower-rated opponent. 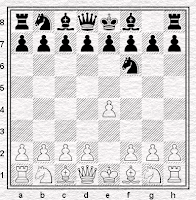 I kept expecting the position, with its locking pawn chains, to demonstrate that the computer awarded White a large advantage only because it didn't understand what was going on. 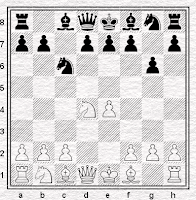 I've always had a weakness, with Black, for openings which offer me a clear idea, which I can try and impose on the game. I don't think it's such a bad way to understand the French, for instance: White sets up a pawn centre, you try to undermine it and keep nagging at that idea for as long as you are able. Perhaps that's why the line that's always appealed to me most has been the MacCutcheon: 1.e4 e6 2.d4 d5 3.Nc3 Nf6 4.Bg5 Bb4. Keep getting after the e4 square until you've made White do something they really didn't want to do: in that way, impose your pattern on the game. It does at least give you a plan. I've played it in serious games a few times, and if I'd ever found anything I liked against the Tarrasch, I'd probably play it more. I've played the Accelerated Dragon, too, at least once - I seem to remember a Surrey League game, probably drawn, for Streatham and Brixton a few years ago. 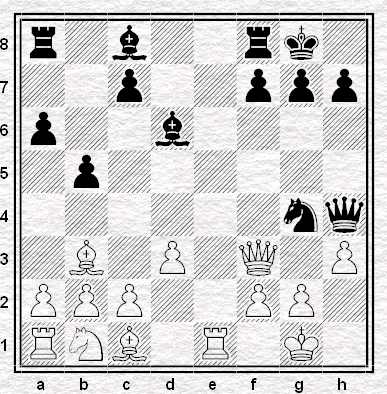 1.e4 c5 2.Nf3 Nc6 3.d4 cxd4 4.Nxd4 g6. 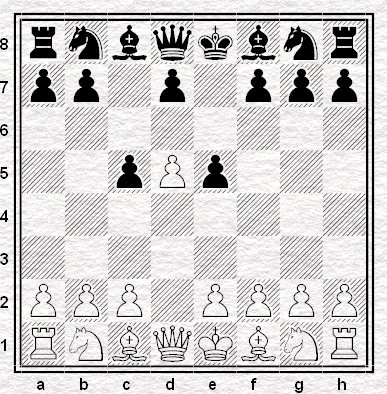 This might not seem like an opening with a particular idea, unless it be to catch White in one of the numerous traps that exist if he or she plays 5.Nc3, but in the event of 5.c4 there's a particular ending which Black tries to reach involving swapping off everything except one Black knight and White's white-squared bishop, which is therefore bad, so Black wins the ending. In all likelihood Black loses well before this ever happens, because White is concentrating on what is happening now rather than on what might happen twenty moves down the track, but I like the idea anyway. However, I made myself a promise a few years ago that I would give up the Sicilian: and I do not intend to break it for a few more years yet. I shall return to the opening, perhaps, when I am an old man, content to try and win with traps and cunning and keen to get into an endgame as quickly as I can. After reading Tony Kosten's splendid if eccentric book on the Philidor some years ago, I decided to give the opening a try, and I think I got a draw the one time I played the Hanham Variation. The idea this time is to overprotect the e5 pawn until the time of your choosing: then you put your knights on good squares like c5 and e5 and take over the position. It's a sound idea and I've played the Breyer variation in the Spanish for years on much the same principle. The problem with the Hanham is the move order: 1.e4 e5 2.Nf3 d6 3.d4 Nd7 runs into 4.Bc4 and a real struggle to keep on the board, while 1.e4 e5 2.Nf3 d6 3.d4 Nf6 allows 4.dxe5 which is considered good for White. There's a Pirc move order, 1.e4 d6 2.d4 Nf6 3.Nc3 e5 but I'm not entirely happy with the queen exchange lines after 4.dxe5 (I'd like to see c4 on the board before I allow that) and if 3...Nbd7 there's 4.f4 which I don't fancy much. Black says to White that whatever White may choose, we're going to play the sort of game Black chooses, with Black trying to run rings around White's centre. 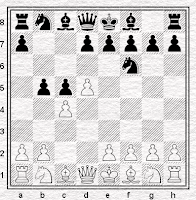 I never wanted to play the Alekhine's as a main defence against 1.e4, but I've always had the notion that one should have a "spare" defence, something perhaps eccentric, insufficiently sound or solid to play throughout one's career (for what are you going to do if somebody finds a refutation?) but worth studying on one's own and deploying as a surprise weapon should the circumstances permit. The trouble is, I'm not sure I want to study a defence which might be refuted, even as a spare: I can't persuade myself it's worth the effort. Every so often I take a look at it, and wonder whether the 4.Nf3 Bg4 line might be one to follow. And then I find the same theory which persuaded me, the last time, that it wasn't. 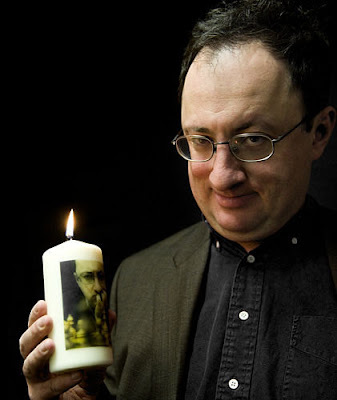 I've played the Chigorin a couple of times, though: I liked Angus Dunnington's book from a few years back and I played it in against Keith Arkell in a five-minute tournament at York. After 1.d4 d5 2.c4 Nc6 he tried 3.Nf3 Bg4 4.cxd5 Bxf3 5.dxc6, of which I was never afraid. He dropped a pawn early on and I kept it all the way into an ending in which I lost on time with knight and pawn against knight when I could, presumably, have claimed a draw. My rapidplay grade was about ninety points worse than his and about fifty points below my normal grade: he may have taken it more casually than he should have done. 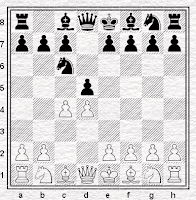 Anyway, I was impressed, tried it again in a Northumberland League game a few weeks later, and lost in about ten moves. But I still look at it now and again: I've never much liked playing against it, and that always makes me want to try it from the other side. 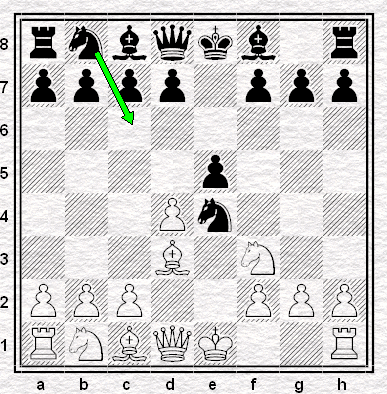 I always have problems with the Benko: in fact I prefer to avoid it by playing Nf3 on the first or second move. 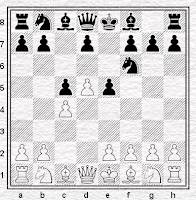 I played the Black side as a kid: sacrifice pawn on the queen side and then play on the vacated files, that was the obvious and successful idea. I did well with it, until I played three games with the Black pieces against Dan Rosen*, now of Ashtead in the Surrey League but then an opponent in school matches. He played 4.a4 and after 4...bxc4 he played a line with f4 and a big pawn centre that I couldn't cope with. After that I went to college and didn't play chess for a few years: when I came back I played the Benko for a bit but never believed in it again. I've never really found an alternative I've been happy with, though, and it's another opening which often nags at me and suggests that I might like to take it up again, as my surprise weapon. So I might: but it doesn't solve the problem of what to do if White does what I do and gets out of it with 2.Nf3. and we're in a slightly more sophisticated version of the 1...c5 2.d5 e5 idea, where White has played c4 thus making that square unavailable to a knight and helping to hem in his f1-bishop. OTB I've only played it once, stupidly, in a simultaneous display nearly thirty years ago: the opponent was Bill Hartston and I was crushed. Still, I have a theory that this might be a good idea in email chess because the computer may not like the closed position. So I can carry out my plan, while my computer-dependent opponent flounders. You'd think that I might learn. 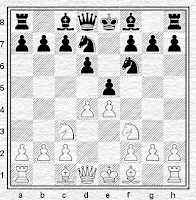 The MacCutcheon, the Chigorin, the Accelerated Dragon, the Hanham Philidor, the Czech Benoni, the Benko Gambit, the Alekhine. All a little eccentric, all with an obvious but perhaps exaggerated thematic point, all, perhaps for that very reason, not entirely sound. But is it not for their imperfections that we love people, too? 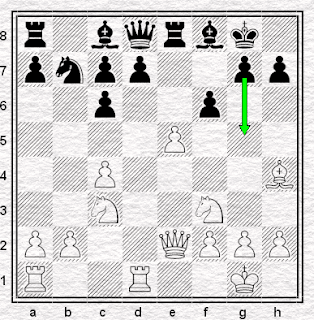 This remarkable move has been played a number of times in the past year, after the sequence 1.e4 e5 2.Nf3 Nc6 3.Bb5 a6 4.Ba4 Nf6 5,O-O Be7 6.Re1 b5 7.Bb3 d6 8.c3 O-O 9.h3 Na5 10.Bc2, one of the most common and best-known in chess. Yet despite its popularity (played by every World Champion from Lasker to Spassky) and its age (played by Chigorin in 1906 and by Schlecter four years before) it appears that none of the great players who have examined the position, in play and in preparation, over the course of a hundred years, saw what a young Polish grandmaster saw last year and played in a splendid game which can be viewed below. The theoretical justification lies in sequences such as 11.exd5 e4! 12.Bxe4 Nxe4 13.Rxe4 Bb7 14.d4 Re8 with a lot of compensation for Black (as played for instance by Magnus Carlsen against Michael Adams and as reproduced on the ChessPublishing site where I discovered the analysis) or the moves played in the original game, in which the rapid advance of the f-pawn persecutes White's minor pieces and his king position. Whether it's sound or not remains to be seen. The Marshall Gambit is ninety this year (and nearly seventy in its present form - was CHO'D Alexander really the first to play 11...c6, as Chessbase Online Database suggests?) so Gajewski's Variation has a long road ahead of it. But what a discovery! a non-profit that fuses music, chess and martial arts to promote unity, strategy and non-violence. The HHCF hosts celebrity chess benefits where underserved youth play chess for educational scholarships and engage cultural icons from various backgrounds. By blending logic and art we pave new paths to greatness for American youth. And if you're as decidedly uncool as me, I suspect this might be the first you've heard of them too. The HHCF also keep up a rather intriguing blog with a whole mixture of articles. As one might expect, the language is a lot more lively than the letters pages of New In Chess, the symbolism a lot more socially relevant than the Informator index. He made and early mistake in the gae and I kept the pressure, but it was a hard win... It takes a nation of millions to hold me back from taking DLabries king. Its a chess thing. And here's a good sample from the serious end of the spectrum: an article that starts "Woe to the statesman whose reason for entering a war do not appear so plausible at its end as at its beginning," asks in its middle, "Can you really put a price on taking a mans site? What is cost of putting a woman in a wheelchair with a bullet? How do we tally the mental scars that heal after the knife wound has healed up?" - & goes on to conclude, "The prisons are packed with people who regret not taking that reflective breath in a moment of anger. Don't let yourself be one of them." Not your average chess blog, not your average chess organization. I would like to clear up some of the misapprehensions and rumours which have been put about concerning my non-appearance in the final round at Hastings yesterday with the result that I was defaulted and finished just out of the prizes. It is not true, for instance, that I made a bet to the effect that I could drink more whiskies than Simon Williams had played moves against Nicholas Pert in the penultimate round. The wager merely concerned Xmas novelty chocolates with different whisky fillings. Nor did I manage all but one and then say "Dylan Thomas only managed seventeen and that was the last thing he did". In fact I managed twenty-three of them and as the box contained twenty-four I was able to leave one and still win the bet. I did not claim that I could stay up "until two or three" without it affecting my chances in the final round. 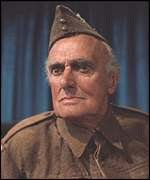 In fact I said I could stay "for another two or three" which was precisely my intention at the point when I said it. I did not leave my hat, scarf, coat, laptop, mobile phone or my copy of the Daily Star in the pub, as I have seen variously reported. In fact, to the best of my knowledge I only forgot the keys to my guest house and I have not read the newspapers since the incident with the photographer, the house in Streatham and the subsequent coverage of my divorce. I did not attempt to break into the room of the WFM who was staying in the same guest house as me. I admit I waved to her as I passed her window while attempting to gain access to my own room via the guttering, but having made eye contact it would have been impolite to do otherwise. I did not assault a police officer after falling to the ground when waving politely caused me to lose my grip on the guttering. I accept that I made physical contact with the officer but only because he was standing directly beneath me at the moment when I fell. Had I not been startled by the light of his torch and his comment to his colleague that it was either a pervert or one of those weirdoes from the chess tournament, I might have maintained my grip even with only one hand. I did not spend the night in the cells and find myself remanded in custody while the final round was being played. In fact, while it is true that I was technically under arrest, I was in the care of the Conquest Hospital who were attending to my broken foot and the minor injuries suffered by the colleague of the arresting officer. It may be true that I shouted "you can't keep me here, I'm a genius!" while in the police station but this was after an operation performed under anaesthetic and I cannot bear full responsibility for my actions in those conditions. I hope this will put a stop to the cascade of falsehoods and exaggerations which have followed on from this regrettable sequence of events. You know the feeling. Hours already spent struggling through the chaos & confusion & complexity of a fully-fought chess game - and then, the nightmare gets worse. Your eyes blear & blur. Your head to start to spin. You stare blinkingly at the board - and the pieces start to wobble. "Motion is added to an otherwise still game," the website says. 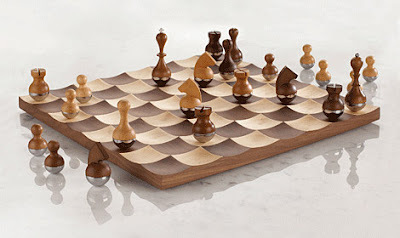 "A concave landscape stabilizes freely quivering chess pieces, creating a lively interaction between board and pieces." Quick question: there are Wikipedia articles on Jacob Aagaard in three languages. One of these is Danish and one is Polish. Without looking it up - can you guess the third? A Speedy Start to the New Year? ... because to revitalize your chess for 2008, the Mid-Season Rapidplay Tournament is here! Open to members of Streatham and Brixton Chess Club (never too late to join!) and Streatham Library Chess Club, the event will be held over two Tuesday evenings on the 8th & 22nd January at our home venue of Woodfield Grove Tennis Club. Entry is free, with the tournament consisting of three rounds each evening starting at 7.30pm, 8.30pm and 9.30pm - & those wishing to play should contact Club President Angus French. Now if that format sounds familiar, it's because last year's Club Championship was exactly the same. That event I advertised then as Your Chance To Beat Me: something Robin Haldane & Adam Fysh-Foskett wasted no time in doing, as you may recall from the half-way & final reports. Something else you might recall is that - somewhat remarkably - that tournament featured no draws whatsoever. If this tournament is anything like that, it promises not only a speedy start to the New Year, but a very exciting one too.